When he has a day off, Joe Dadey packs a lunch before leaving his home in Saranac Lake, the largest community within Adirondack Park. He stops by Blue Moon Cafe — a locals’ favorite on Main Street — for a hearty breakfast. (If he’s crunched for time, he’s more likely to grab a caffeine fix at Origin Coffee.) Fueled and ready to go, Dadey heads off for his favorite hike up the Jay Mountain ridge. After a day in the fresh mountain air, he notes there are a number of breweries scattered around the area that promise good food and drink to cap off a satisfying day. 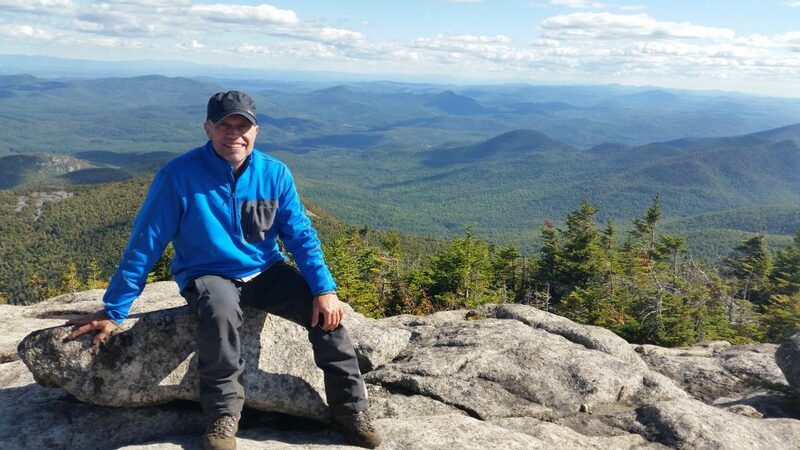 Though you may find Dadey hiking Jay Mountain, the beauty of the Adirondacks is its exceptional diversity — so everyone can chart their own perfect day in upstate New York’s lake region. 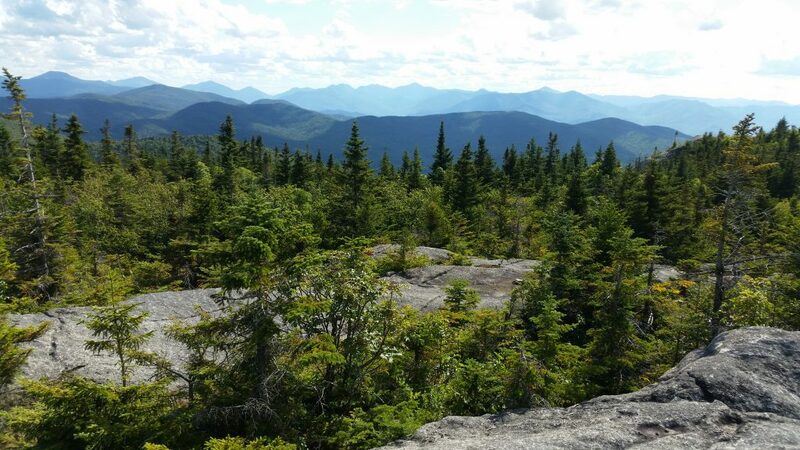 The Adirondack region features more than 100 small towns, several mountain peaks and lakes, untold miles of hiking trails and waterways, and thousands of acres of forest filled with spruce fir, beech birch, and maple trees. The area is an outdoor lover’s playground and birthplace of the North American conservation movement. 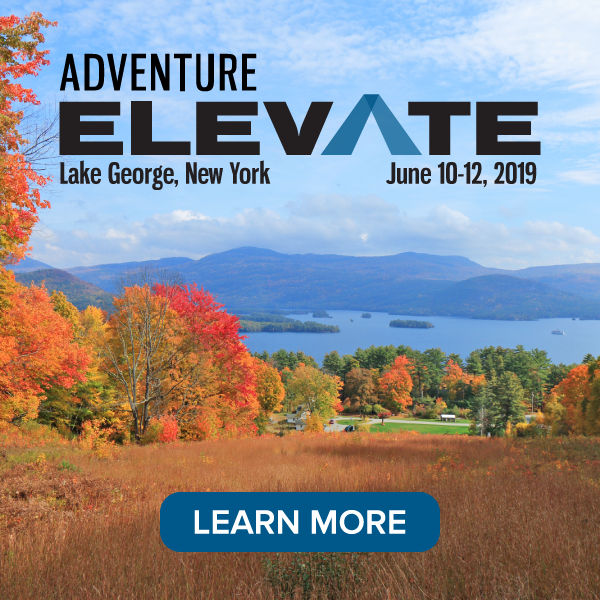 Fittingly, it’s also the site of AdventureELEVATE 2019, which will be held 10-12 June 2019 in Lake George, which is situated in the southeast corner of the Adirondacks. When Dadey isn’t out exploring the area himself, you can find him hard at work on Adirondack Hamlets to Huts. Incorporated in 2016, the nonprofit organization is in the process of creating more than 50 routes that start, pass through, and finish in communities located within the 6 million-acre Adirondack Park. This park — the largest publicly protected area in the lower 48 states — is bigger than Yosemite, Yellowstone, Glacier, Grand Canyon, and the Great Smoky Mountains National Parks combined, and yet even it is just one small corner of this rich and diverse area in New York state. “What the Adirondacks provides is this really nice mix of mountains, lakes, and ponds,” Dadey said, “and the mountains have a lot of personality, both collectively and individually.” The park itself sits on both public and private land, and several small towns offer a human dimension to the natural elements. “These communities sprinkled throughout add to the flavor and character of the park,” Dadey said. 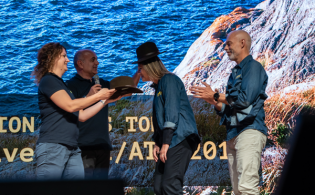 Ultimately, the Hamlets to Huts’ routes will give travelers a chance to hike, cycle, or paddle — or participate in any combination of the three — as they explore the park for just a few hours or even several days without ever needing to carry camping equipment. These routes will vary in length and mileage, with initial routes connecting two to four communities, so travelers can mix their wilderness experiences with time spent in small towns meeting locals and learning about the area’s history and culture. At night, they’ll stay in a variety of accommodations ranging from yurts and cabins to inns and B&Bs. 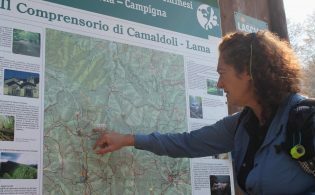 “We’re hoping to integrate people’s experiences in the communities with their experiences in the wildlands and the Adirondacks in general,” Dadey said. Don’t miss out on a Day of Adventure in the Adirondacks! The Day of Adventure will be live for preview tomorrow, 4 April. Sign up to be notified. There’s still time to register for AdventureELEVATE. Register now.